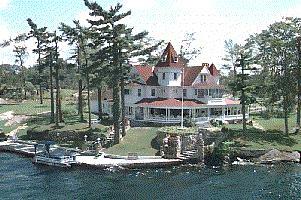 Departing from Alexandria Bay, the Uncle Sam Boat Tours can take you around the 1000 islands like never before. Enjoy the scenic views and the historic atmosphere that surrounds you. 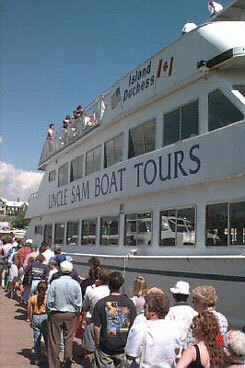 The Uncle Sam Two Nation Tour has long been a favorite of visitors to the Thousand Islands Region. On this scenic tour you will pass by many island mansions owned or visited by some of the most famous names in American history, learning many interesting facts and legends along the way. 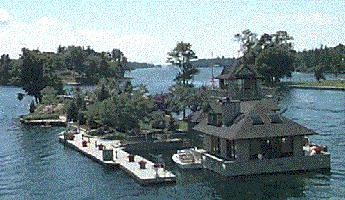 For over a hundred years the Thousand Islands area has been a popular vacation retreat for some of the wealthiest and most influential people in North America. You’ll recognize many names, like Kellogg (of breakfast cereal fame), Abraham & Strauss (who married twin sisters and built twin mansions here, and who died together in the sinking of the Titanic), John Jacob Astor, George Pullman (the inventor of the Pullman railroad car), and Ulysses S. Grant, President of the United States, Thomas E. Dewey, Governor of New York, to name just a few. You’ll see the vacation homes of many other people whose names you might not recognize, but whose inventions and the companies they built will be very familiar to you, like the Daisy BB Company & Beechnut Foods. The family of the inventor of the Nut Cracker had a home here, and the man who invented the popular Life Saver candy was one of the areas most important area residents. Not all the island homes belong to the “Rich and Famous.” Some folks are just plain rich, with their biggest claim to fame being that we talk about their spectacular homes as we pass by. But you’ll also see the island retreats of “regular” people too, for many of the islands and their homes are within the reach of the average working family today. 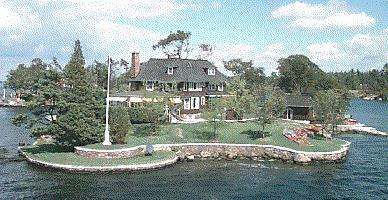 So it won’t hurt to dream a bit about owning such a summer home as you pass by. The Uncle Sam Boat Tour’s Two Nation Tour takes you across the International Boundary between the United States and Canada, and we’ll travel in Canadian waters for much of the trip. Along the tour you’ll also see many other interesting structures, both natural and man-made. Devils Oven is a curious island that is noteworthy for its once secret cave, where the famous pirate Bill Johnston hid from authorities after sinking the Sir Robert Peel. 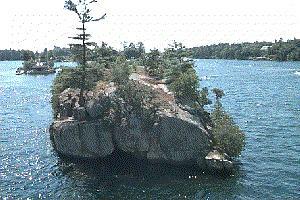 You’ll see Tom Thumb Island, perhaps the smallest island in the region. And if you’ll pay close attention you may even catch a glimpse of a mermaid and a naked sun goddess greeting boaters as they pass. I have nothing but fond memories of the many times I toured the Thousand Islands on Uncle Sam, dating from childhood to becoming ancient. 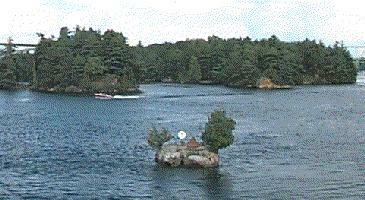 Don’t leave the 1000 Islands without riding Uncle Sam. Their dinner cruise is especially wonderful. We come from Lordstown, Ohio almost every year and go the two nation tour. The trip on Uncle Sam Boat Tour is wonderful and we are going to do it again in Oct 2014. My wife and I visited Alex Bay and really enjoyed the 2 Nation Tour. 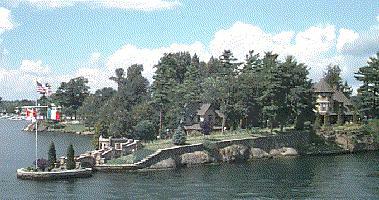 With the stop at Boldt Castle, we spent 3-4 hours on the river and it was a remarkable day. A really unique experience.